Pack your hiking boots and puffy jacket because Queenstown’s snow‐capped mountains, shimmering lakes and rivers, and lush countryside are calling. When touching down in Queenstown, it’s hard not to be excited by the landscape below. The bird’s‐eye view of the city – edging out onto Lake Wakatipu and backed by the Remarkables range – is a striking sight to behold. And that’s only scratching the surface of what awaits you in the South Island’s main port. A dream destination for adrenaline junkies, adventure lovers and those who crave nature escapes, ahead, we pinpoint six of the best Queenstown activities that all deliver a fix of the great outdoors. Remember that view you spied through the plane window? 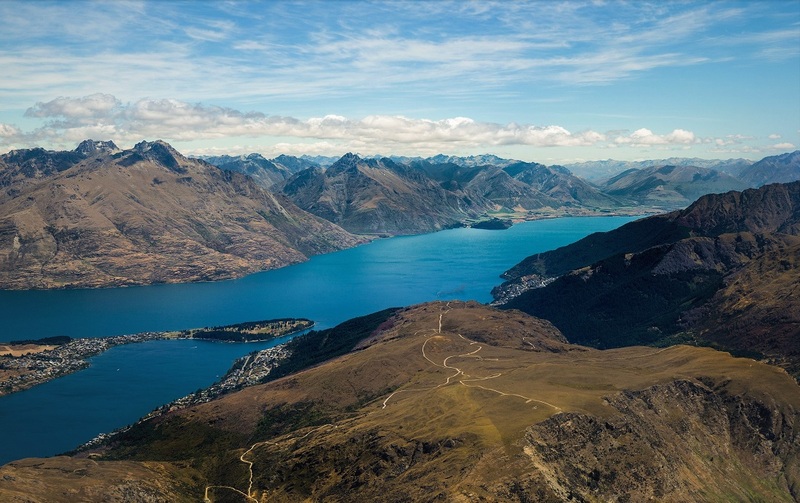 Hiking the Ben Lomond trail is one of the most popular Queenstown activities for visitor and offers one of the best vantages to all that beauty (and the effort you exert will reward you with an envy‐inducing snap). With the trailhead conveniently located less than five minutes’ drive from town, you can fuel up at a laneway or waterside cafe before tackling the challenging ascent, which rises to 1438 metres elevation over its course. Depending on how game you are, you have two options: complete the three‐ to four‐hour return to the saddle, or continue climbing to the summit, which will be a full‐day hike of between six and eight hours. Whichever you choose, the scramble will be worth it when you exhale and stare out across the craggy mountaintops. to Queenstown Bike Park – strap your bike to the cable car’s side, and drop into 30 trails spanning 30‐plus kilometres downhill. After a big day of hiking, drive 10 minutes from Queenstown to Arthurs Point, where the Onsen Hot Pools invite soaking sore muscles while taking in a spectacular scene. With its lofty position overlooking Shotover River Canyon, the indoor‐outdoor tubs are a more indulgent take on outdoor Queenstown activities and offer views of the valley’s aquamarine lake snaking between the cliffs. Schedule your swim for sunset to bathe in a sky streaked orange, purple and pink, or float in the pools by night to watch for constellations and shooting stars. sports such as stand‐up paddle boarding and kayaking are also options, and fishing enthusiasts can cast their lines for giant speckled trout. If you’d prefer your Queenstown activities to have a bit more pace, jump aboard a jet ski, or book a seat on the Hydro Attack, which will have you zipping in and out of the water in the belly of a shark-shaped submersible vessel. At the head of Lake Wakatipu, where the Dart River flows in on the northern side, Lord of the Rings fans can get a taste of Middle Earth on a jet boat, horseback, or from the seat of a 4WD. Glenorchy is around 45 minutes’ drive from Queenstown, but it’s a gorgeous car ride that will distract you from the time. Of course, unless you’re a die‐hard fan of the franchise, there’s plenty of stunning scenery in and closer around Queenstown. Along the road to Glenorchy and only 15 minutes’ drive from Queenstown is the magical Moke Lake. Surrounded by mountains, and with a low‐key loop track around its perimeter for you to hike or cycle, it’s the ideal place to spend a slow afternoon and take up some more leisurely Queenstown activities. Gather up some local cheeses, perhaps a bottle of Central Otago pinot noir, and bring along a blanket to spread out in the grasslands for a picture‐perfect picnic. Already packed your walking shoes, woolly layers and sense of adventure, ready to experience these great things to do in Queenstown? All you need is cheap flights – and you find the best affordable airfares to Queenstown on Webjet.